If you are interested in a zone control system for your Columbus area home, call Quality Air Heating and Air Conditioning. If you have an existing forced air heating system, we can add a zone control to help you better control the temperature in your home. If you are building a new house, it’s easy to install zone control at the same time as your heating and air conditioning system. Saving energy can be easy, and zone control is simple way to start making your home more energy efficient. Zone control systems can be integrated into your forced air heating system. First, dampers are placed inside the ductwork, and those are connected to a control board. When you want to shut off the heat to a certain room, the damper is closed and the air inside the ductwork is pressurized. Simply closing off a vent will not provide this benefit, and in fact can do more harm than good because it will lead to imbalanced air pressure, which can cause all sorts of problems. Not only does zone control help your heating system by preventing excess wear and tear, but it also saves energy since you are only heating one zone instead of the entire home at once. You can also install programmable thermostats for each zone to help save even more energy. While set back thermostats are designed to automatically set back your heating system (or close off areas that aren’t being used), they are intended to work for only a certain type of heating system. Ask your contractor if you aren’t sure what type of thermostat to use for your new zone control system. With proper maintenance, your zone control system should last you for many years. Keep in mind that performance starts with proper installation. 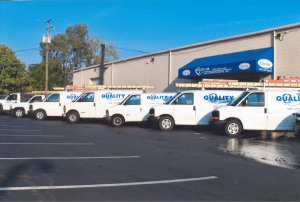 Call Quality Air Heating and Air Conditioning for all your Columbus heating and zone control needs.